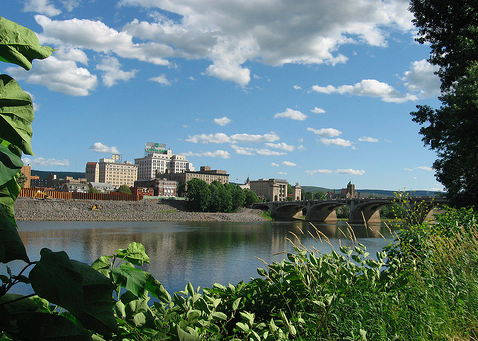 View of Wilkes-Barre, PA in the Delaware and Lehigh National Heritage Corridor. In the face of challenges such as climate change and urban sprawl not to mention shrinking budgets and at-times hostile lawmakers, how can those interested in large landscape conservation ensure that their work is both effective and sustainable? In the most recent issue of The George Wright Forum, a variety of scholars and practitioners examine these types of questions, analyzing the past and present of landscape-scale work in North America. Among the efforts reviewed is the National Heritage Areas (NHA) program, a more than 30-years old initiative that now includes 49 areas stretching from New England to Alaska. Each NHA is authorized by Congress and, though placed in the portfolio of NPS, operates with a great degree of autonomy. These are lived-in landscapes, with no federal regulatory authority linked to designation. The regions included range from vibrant cityscapes to vast rural farmland and ranches. The individual NHAs are managed by nonprofits, state and local governments, universities, or federal commissions and operate with a high degree of local control. The direct funding commitment for both program administration and project work is limited and NHAs seek support from other funding sources and partnership arrangements. Program goals include protection of natural and cultural resources, education, recreation and economic development. Since the mid 2000s, a significant number of NHAs have been evaluated in an effort both to understand their investments and accomplishments and assess their progress relative to the goals laid out in each individual piece of authorizing legislation. The results have been overwhelmingly positive, demonstrating the potential of partnership-based endeavors on areas such as historic preservation, interpretation and trail development, for example. To learn more about key lessons from NHA work as well the history of the program and its roots in the Reagan administration, read the entire article, “National Heritage Areas: Thirty Years of Working to Scale,” here. Thanks to The George Wright Forum for allowing us to share this piece.